Happy Tuesday! It’s almost summer and I’m back … with another way to use my new favorite lemon secret sauce! 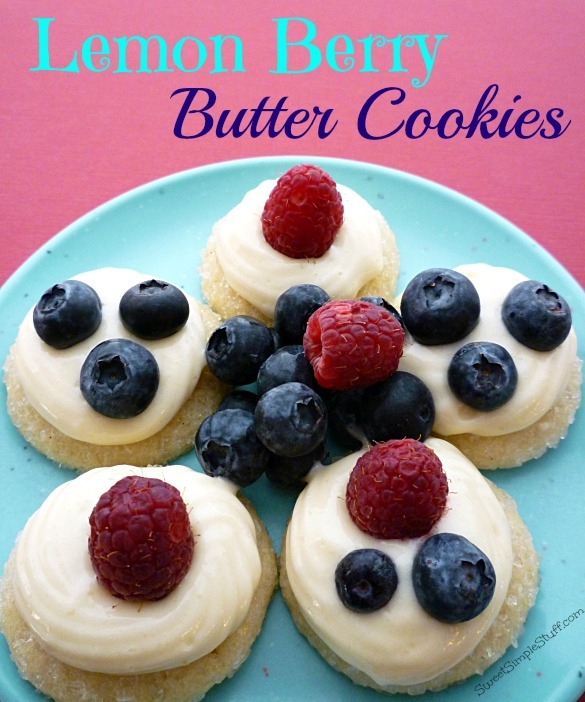 I’m kind of hung up on berries and lemon right now, but I promise that I’ll be moving on to Nutter Butter cookies, chocolate, cupcakes or some other sweet thing 😉 I’m sure that these Lemon Berry Butter Cookies will put a smile on your face! 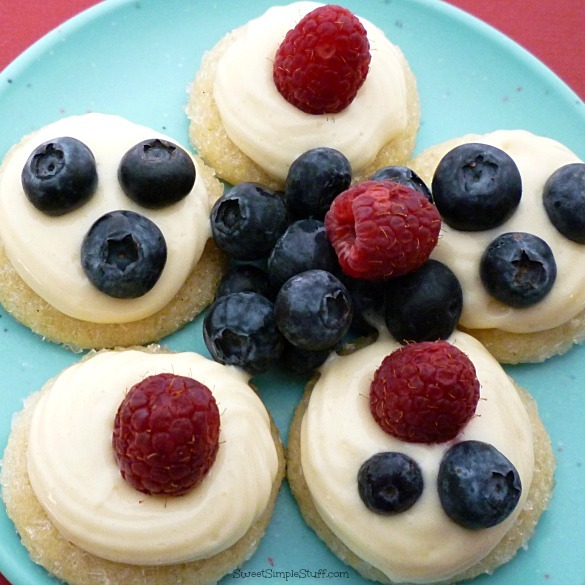 The lemon flavor provides a little tang … crystal sugar give the cookies a great crunch and the berries are juicy bites of springtime! Baking or dessert making has not been happening too much around here lately. Do you find that you have too many projects and never enough time? We have unfinished projects up the wazoo! I’ve been sewing, doing a little gardening, organizing, cleaning and painting. Our painter (me) finally showed up … as the hubby would say. I do the painting, because I’m picky … not perfect … just picky about the way the hubby (or anyone else) paints 😉 My biggest problem is that I put off doing the painting … I’d rather bake, do laundry or shop … anything other than paint! Maybe I should stop painting and start exercising, because I ate waaaay too many of these cookies! Actually, I ran out of paint and need to buy more … have to do two more doors and our bedroom will finally be done! Preheat oven to 350°F. Line baking sheets with parchment. In a large bowl, use a mixer to cream butter and sugar. Add egg and vanilla, beat well. Add about half of the flour and beat well, add remaining flour and beat well. Roll dough into 1″ balls, roll dough in crystal sugar and place on prepared baking sheets about 2″ apart. Bake 11 -13 minutes. The bottom of the cookies will be light golden brown. Remove cookies from oven, let sit on baking sheet for a few minutes, then transfer to a cooling rack and cool completely . Makes 36 – 40 cookies. 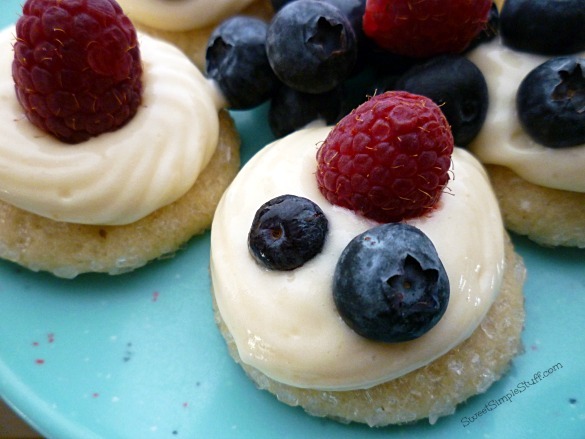 Frost cookies with lemon sauce, top with a few berries and serve. Note: Refrigerate any remaining frosted cookies, beware that they may become slightly soft (but still yummy). The cookies are best when served immediately. Son#3 is not a fan of lemon … he loved the cookies before they were frosted! Im going to make these cookies sometime in the next two weeks. I love lemon! Oh, my, this look wonderful and we do like our lemon flavored sweets here at our house. I totally love your night stand. Your hubby really done a wonderful job. The new hardware really sets off the black. Thank you Colleen 😉 Wow, you hit a great sale! I’ll pass the compliment on to the hubby! Those cookies look sooooo delish! I seem to always be pinning photos from your site! Hopefully I can get time to try some of those pins soon! These cookies look so soft and delicious and purely delicious. I now it would be difficult to stop at just one. also love your DYI project. 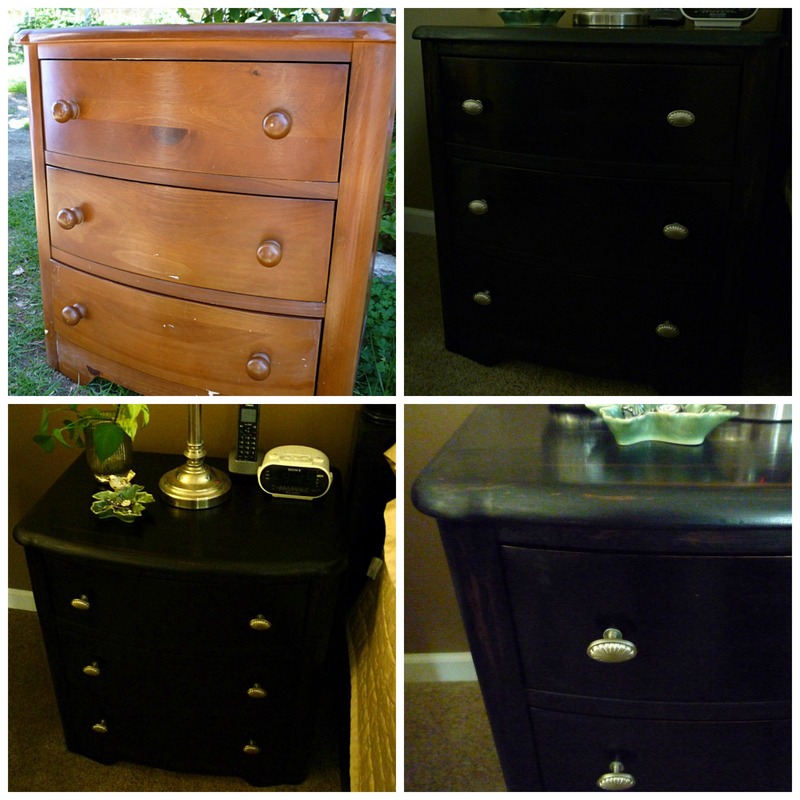 Before my husband and I moved to Asia we always refurbished antique furniture and it was really nice to see something that was in pieces transformed into something beautiful.